In general, I pay pretty close attention to movies and movie news. Shocking, I know. 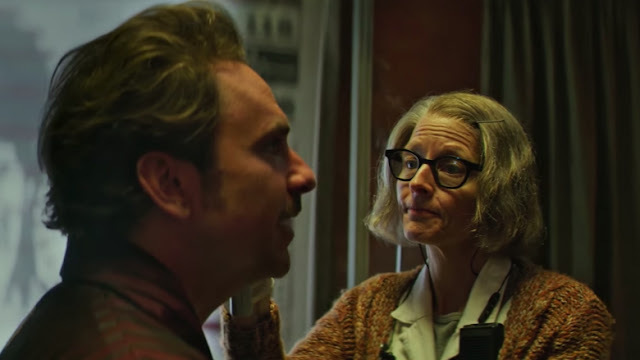 But I have to admit, I have only the vaguest recollection of hearing the name Hotel Artemis. That oversight has been corrected, however, thanks to this awesome new trailer for the Jodie Foster starring sci-fi action crime thriller. This has my full attention. The first thing you probably noticed about this Hotel Artemis trailer is the insane cast. Not only does it star Jodie Foster, but it also features Sterling K. Brown, Sofia Boutella, Jeff Goldblum, Dave Bautista, Charlie Day, Jenny Slate, Brian Tyree Henry, andZachary Quinto. That’s a hell of a roster for first-time director Drew Pearce to play with. Then again, when you’ve written things like Mission: Impossible—Rogue Nation and Iron Man 3 before making the jump to the big chair, it makes more sense you can assemble such a cast. He probably has more resources than the rest of us. It doesn't hurt matters that Cliff Martinez (Only God Forgives) handles the music and frequent Park Chan-wook collaborator Chung Chung-hoon (The Handmaiden, Lady Vengeance) takes care of the cinematography. This set up reminds me of the Continental from John Wick, but instead of an upscale inn for assassins, Hotel Artemis is a hospital for outlaw members. It operates on a set of strict rules and guidelines, an SOP that has allowed it to remain in place over the years. That way of life, as clearly indicated by this trailer, faces a new threat as it comes under attack by a vicious crime boss. I never knew I needed to see Jeff Goldblum play a gangster, but sweet baby Jesus, I’m excited for it. I’m also way into watching batty Jodie Foster get all kinds of gnarly—watching her aww shucks façade, you know she has a mean streak waiting to explode. One thing I’m curious to see is how the setting and sci-fi trappings figure into the story. Hotel Artemis takes place in a near future, and we see riots and political unrest in the streets. It’s going to be interesting whether or not those are key themes and points or if they’re window dressing and narrative scaffolding. There’s potential for some interesting moves in this framework. Hotel Artemis hits theaters June 8.